In accordance with my previous posts from November and December 2017 (here and here), the SP500 index overshoot finally reached its logical end two weeks ago. Interestingly, merely testing the blue trendline was not enough. With the 2017 close precisely at the trendline, in Januuary this year Spoos went for the overshoot reaching the trendline’s uppermost parallel and gaining another 200 pts. Also worth noting is that (for the time being) the index has found support at the outer red trendline (the 8 year long rally true resistance level) and the absolute index level of 2597.70. 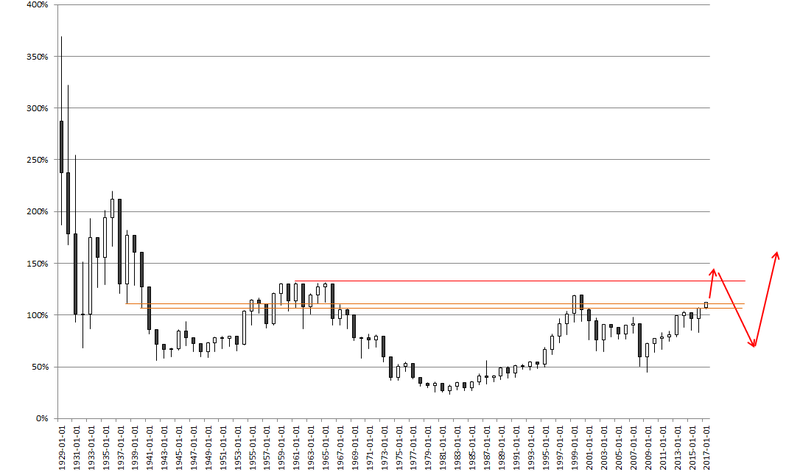 However, this is to show as a temporary support and more of a confirmation of further downside action. The absolute level is not a coincidence either. On Jan 26 the seasonally adjusted Q4 2017 GDP was reported at $19,738.89 BN. When this number is multiplied by 131.62% and divided by 10 the result is $2597.70 (the logic behind this calculation was described on several occasions in my previous posts e.g. here). The question is what comes next. I strongly believe that this is the first sign of a correction that will span over at least a couple of years with SP500 index eventually falling below 2000 level and maybe even below 1900 prior to departing on its last rally to (well?) 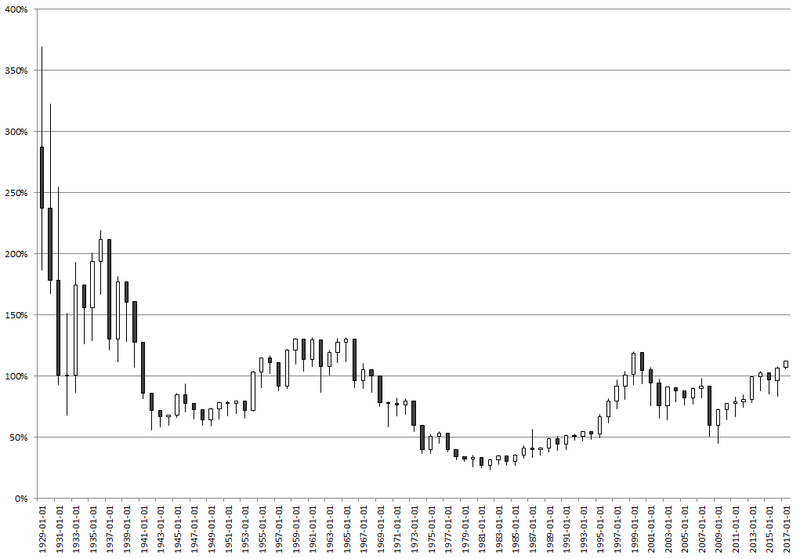 above 3000 at which point we may expect the great crash scheduled for not earlier than mid 2020’s. However, a scenario in which the index makes another ATH before the present correction resumes its downward momentum is a valid possibility. The provided information does not constitute investment advice of any kind. In no event shall the owner of this web site or any of its authors and/or personnel be held responsible for any damages or losses consequential or inconsequential resulting from the use of this web site and/or its contents including but not limited to damages or losses resulting from taking action or not taking action based on the provided content. Yesterday the US stock market reached its trendline breakout testing target (first mentioned in my October post) and cleared the last technical event pending the reversal. In my February post I noted that stocks were not overvalued at the time and that there was still room for some more upside. However, as of Oct 2017 end of month, with a confluence of two very important (technical) events, that is no longer the case, at least not from the technical perspective. 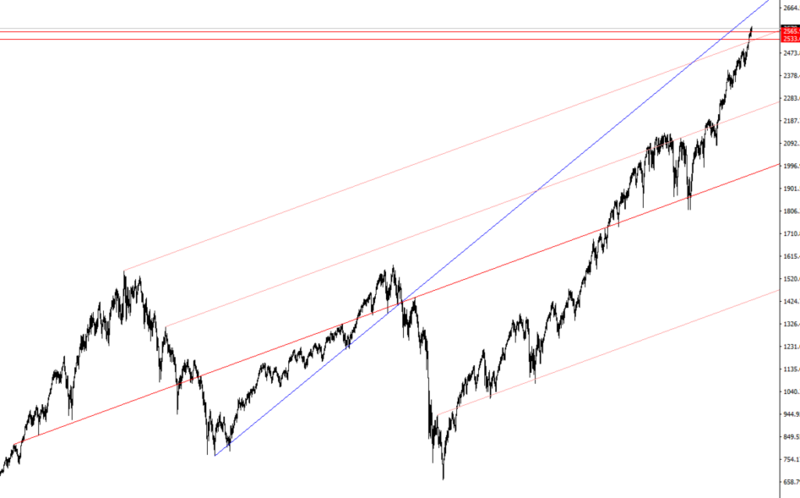 As shown in the chart above, last month the SP500 index hit and closed outside its upper channel bound. The other simultaneous event was that it also first hit 2533.62 level (2017-Q2 seasonally adjusted GDP of $19,250 bn * ~131.62% / 10) and then two weeks ago it hit 2565.93 (2017-Q3 seasonally adjusted GDP of $19,495.48 bn * ~131.62% / 10). The 131.62% ratio is 78.6% retracement of the SP500 index per seasonally adjusted GDP (in bn) ratio move from 2000-Q1 high at 154.83% to 2009-Q1 low at 46.36%. The only technical event still pending is testing the trendline shown above, that was pierced through in the last days of 2007 but has never been tested by a move of the same order of magnitude. If the present rally is after testing this trendline prior to a “major” correction, then further upisde to touch the trendline at 2634+ points is to be expected, with absolute target moving upwards along with the ascending trendline as more time is required for the price to reach it. 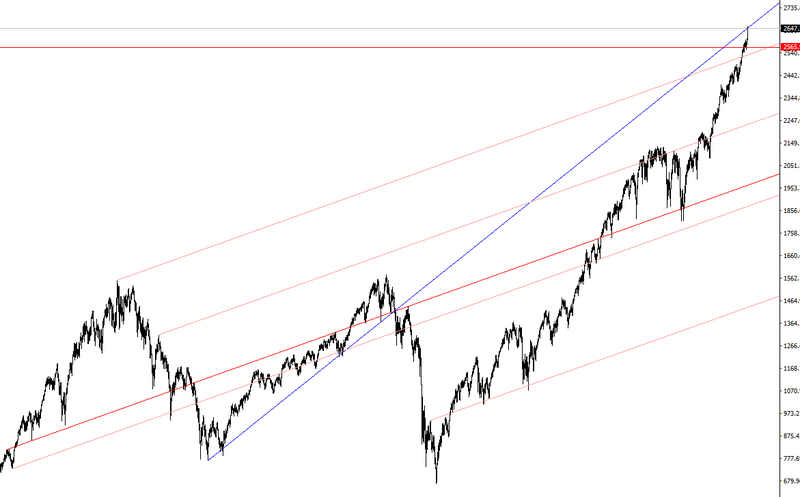 In any case, the correction involved with or without first testing the said trendline should eventually hit the mean (red) trendline in a 20%+ move downwards and in doing so erase the entire Trump post-election move and probably fall below 2000 level only upon which the index will most probably bounce and continue the rally to its long term target above 3009 level. I used to be very bearish about SP500 above 2,104 but my most recent findings have changed my mind to the tune of 650+ more points to the upside from the present level of ~2,360. 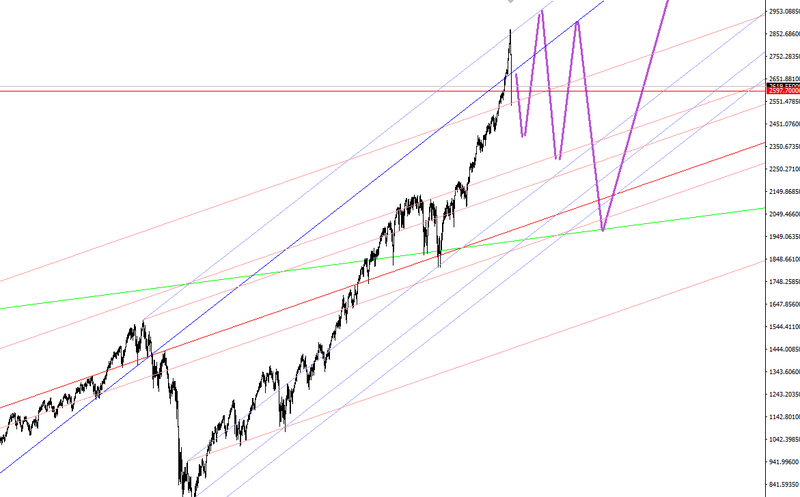 In this entry I am elaborating on a technical aspect of what I believe is going on with the US stock market, as well as what’s coming around the corner. Admittedly, it took me some time before questioning all underlying assumptions of my failed mid-term bearish case. If it’s any consolation the failure to identify the bull market continuation came shortly after a winning streak of successful and properly timed short trades back in 2015 and 2016. It’s not really the fault of the indicator per se as much as it is of its limited historical data. 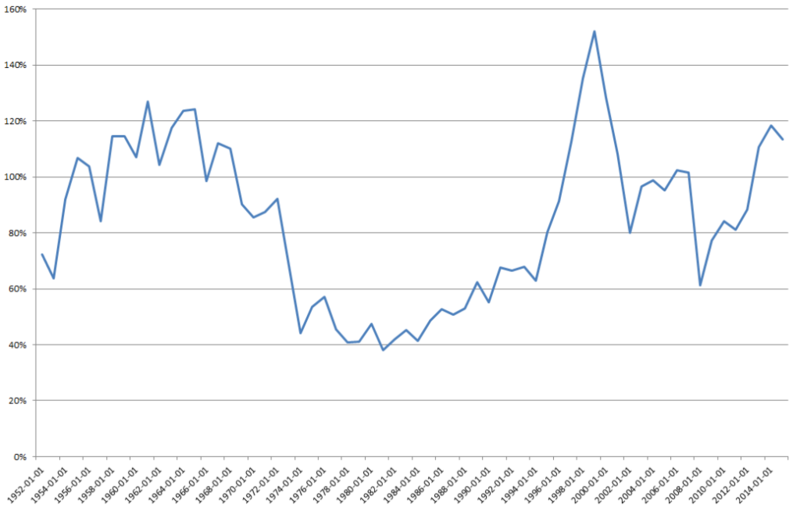 With its US market cap nominator starting in 1952, the indicator signals that the market is overvalued by historical standards. In technical terms, such as it is, it’s just begging for a divergent new high upon which all hell will break loose. Betting on the latter, or more precisely, on an SP500 correction down to at least 1,500 – 1,600 points prior to finally soaring to a supposedly divergent new high at ~3,000 points, cost me dearly. One mistake was taking into consideration a line chart indicator based on year end close values (or even quarterly close values for that matter) for such a chart configuration lacks indispensable information (read highs and lows). The other much more misleading mistake was relying on data starting in 1952 without even a vague notion of what the ratio numbers used to be like prior to that year. 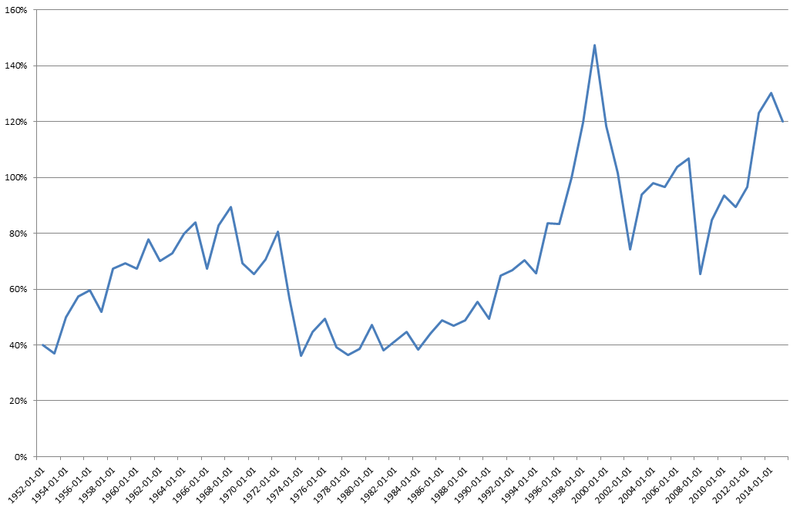 As a workaround for the lack of data before 1952, I now use SP500 and DJI30 historical data instead. 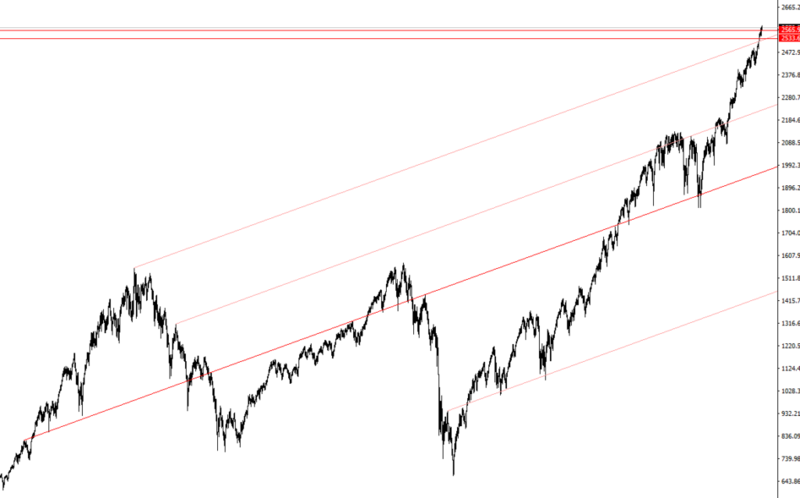 The first test is about visually comparing stock index based ratios with the original indicator results and for this purpose I use the same configuration from 1952 to 2015. The charts display similar (although skewed) patterns with respect to the original indicator with Dow to GDP ratio obviously diverging more than the SP500’s ratio (one possible reason for this is DJI30 index being price weighted). It’s also useful keeping in mind that the component structures of both indices have occasionally changed over time thus affecting their relative significance. 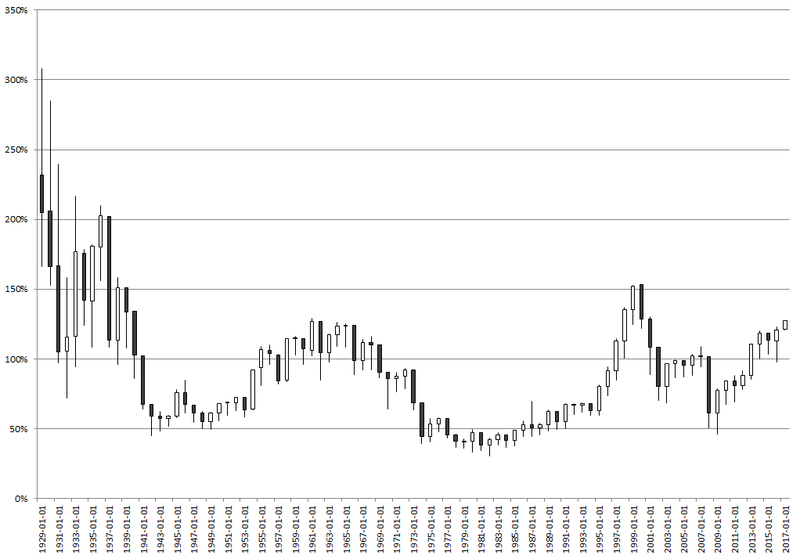 In technical analysis, having access to the historical data of analyzed value levels is crucial. Ideally, all relevant historical data should be made available, or in short: If something happened there before it should be in the data. 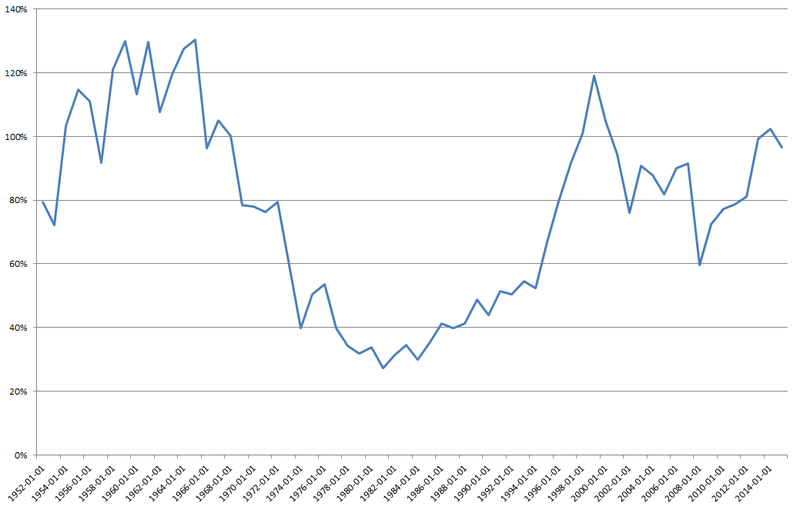 Both charts now begin in 1929 which is from as far as I could obtain the US nominal GDP data. Although different, charts tell similar stories to an experienced technician. First of all, it now becomes obvious that stocks are not overvalued by historical standards, at least not in the mid-term nor in the very long run. 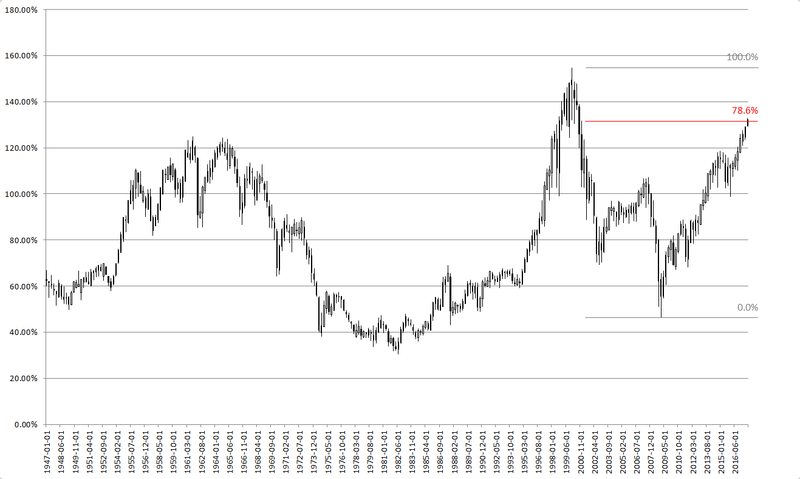 Both ratios have been turning up in what seems as a 35 year long reversal. Secondly, judging by the most recent bar formation and the regaining of confidence it signals, it is easily conceivable that there will be no significant contraction until both ratios reach their new multi decade highs. Technically, the absolute mid- term target for SP500 to GDP ratio can be observed at 158.1% (the SP500 to GDP ratio 1938 high). This target matches almost perfectly the ultimate SP500 fib expansion of 423.6% at 3,009.34 and its 162.1% implied SP500 to GDP ratio (relative to the last available GDP update of USD 18,566.9 BN). This difference of just 4% between the two targets can be easily overcome by a minor ratio target overshoot and/or a couple of more years of similar GDP growth rate around 2%. 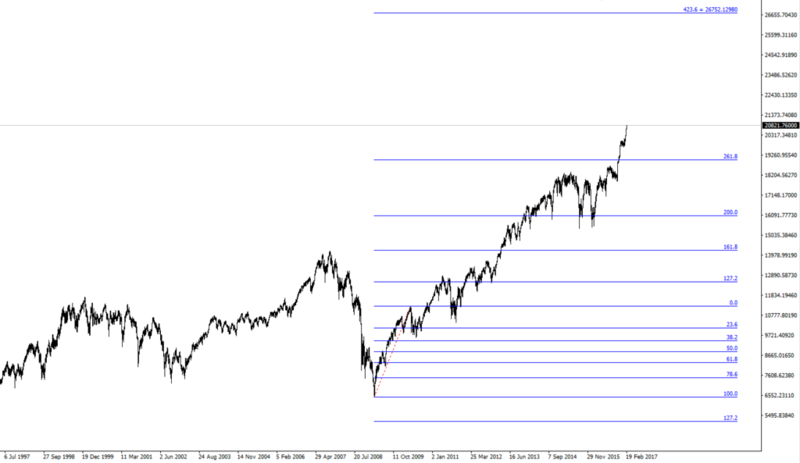 The SP500 index fib target at 3,009.34 comes from this 37.8% SP500 contraction in 2010 which just 0.4% shy of 38.2% falls into the previous fib retracement level of 23.6%, hence the resulting expansion target of 423.6%. It was this particular fib setup that I used when first estimating the ultimate then-thought-long-term SP500 bull target (at 3,009.34). Also, by taking the market cap to GDP indicator for granted I counted on at least a ~25% intermediate contraction where there probably wasn’t any. At the time, the only red flag against a meaningful correction was what seemed as a very early 3rd (Elliott) wave, an almost perfect example of 127.2% – 23.6% expansion / contraction back in 2011 (with high at 1,370.58 and low at 1,074.77). The Dow fib setup for the same case of 2010 23.6% contraction and 423.6% expansion targets a level of 26,752.13 which relative to the latest GDP update implies a Dow to GDP ratio of 144.1% or substantially lower than the 1938 high’s 181.8%. This Dow ratio “divergence” signals that it is most probably not going to reach its 1938 high prior to a major correction of both SP500 and Dow. It also sets the most likely mid- term bull target for Dow to GDP ratio above the 1961 high of 131.6% (being compatible with the implied target of 144.1% again with a combination of an overshoot and the expected GDP growth rate). The effective Dow to GDP ratio resistance level seems to date back from 1938 and 1940 lows (111.6% and 107.3% respectively). It’s worth noting that with the latest GDP update of USD 18,566.9 BN, the implied Dow value for the 111.6% ratio level is 20,712.5 which is precisely the value Dow hit last week, and which now makes it reasonable to expect some sort of a retracement although the in-between time span of 80 years may somewhat relativize the exact level. Additionally, a Dow level of a little above 21,000 corresponds to ~2,409 in SP500 or 129.8% in its currently implied GDP ratio. 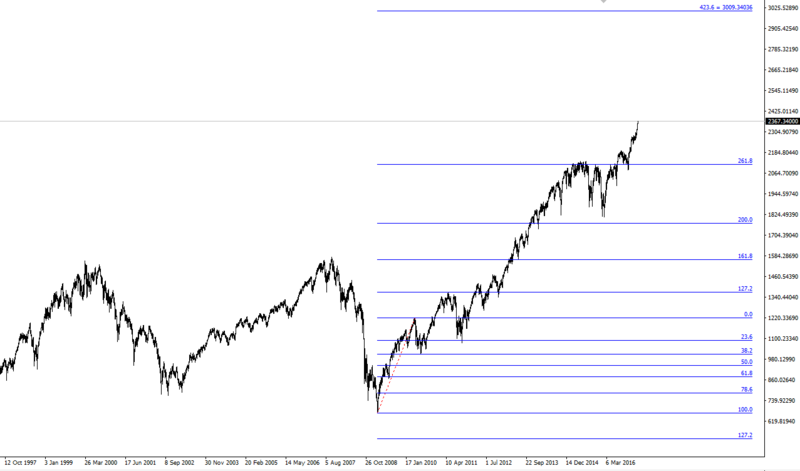 This 129.8% in SP500 to GDP ratio also represents a fib retracement of 78.6% relative to the ratio 1999 – 2009 contraction. This confluence of technical events signals an observable correction somewhere around the present levels of Dow and SP500. 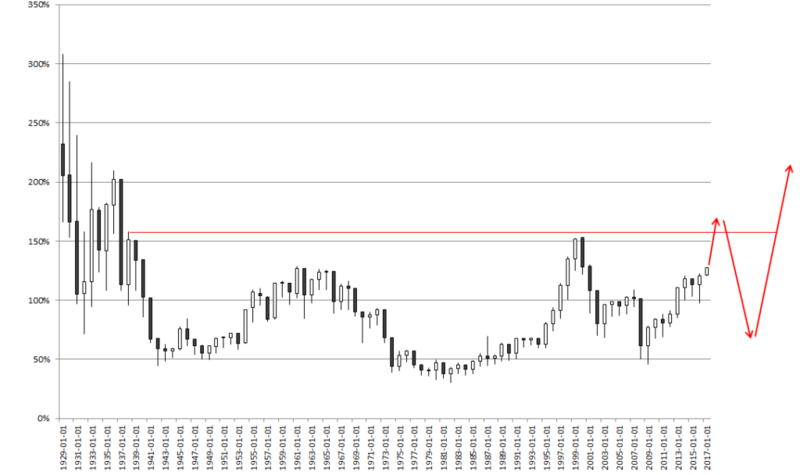 On the other hand, the long term context of this Dow resistance level is such that it is historically the third time it is being tested, although this time it’s tested in a form of a breakout move relative to the 1999 – 2009 Dow to GDP ratio contraction which according to the chart does not directly confront this particular resistance level but is eyeing the 1961 high (131.6%) instead. It is only after reaching above this 131.6% ratio high that the resistance level from 1938/40 will have direct impact on the Dow upside move, hence the forecasted major correction once above 144.1%. The lack of a significant correction should be interpreted as a (market) statement of confidence in the long term economic and corporate earnings growth. My present forecast is that there is going to be a major correction once this rally ends at or around the said mid-term targets. 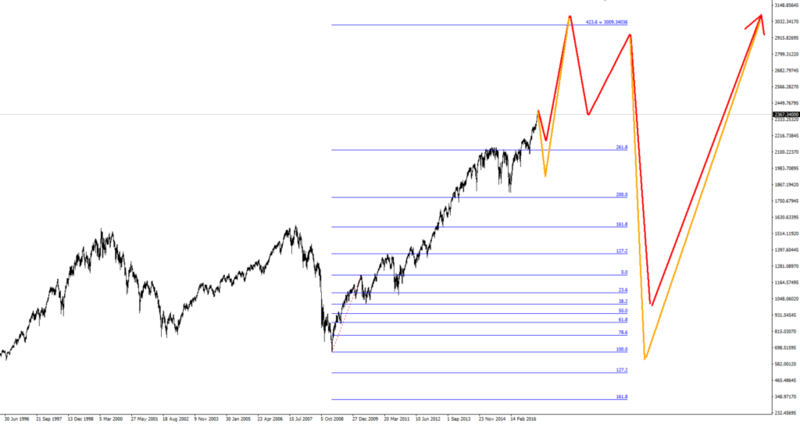 When that time comes, both SP500 and Dow may easily drop below their 2010 expansionary fib retracement levels (at 1,010.91 and 9,614.32 points respectively) and in doing so erase virtually the entire stimulus fueled move. For the time being it’s a good long term sign (for the economy in general) that within the ongoing rally there is no precursor to a major correction. 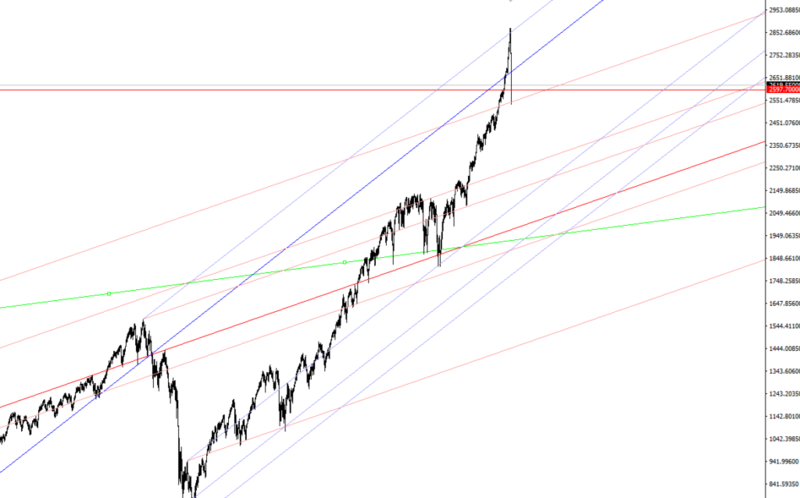 Alternatively, the correction could end at the absolute level that I initially used to forecast with SP500 falling “just” 50% from 3,000+ points to 1,500 or so, but I have more than a single reason to believe it won’t stop there although it could at least temporarily bounce off that level. The most important reason why I believe the drop will be deeper than 50% is because of this single fact that corrections (and retracements in general) typically tend to undo the part of a move that was fueled by presumptions proved no longer to valid (even if/when renewed in the meantime). In this case it’s the part of the rally that was fueled by the trust in central bank stimulus. I don’t subscribe to a view supporting momentum chasing and I still think it can be detrimental for short term trading even with the market so biased to the upside. 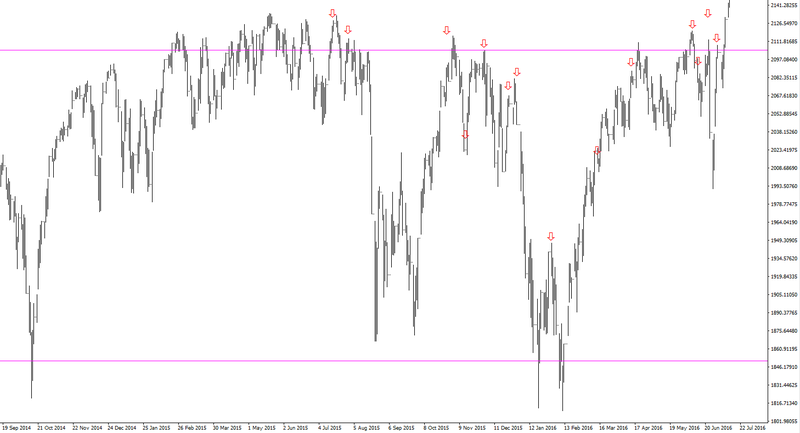 A temporary drop below 1,900 in SP500 is a possible scenario. For those who have been long stocks for some time and feel immune to a correction of 200+ points, I guess there’s nothing wrong in staying long for the time being. Basically, it all depends on when it is exactly that the market intends to reach its ultimate mid-term bull target. If it’s around 2020, then a correction is coming quite soon and buying the dip remains the only reasonable mid-term bullish strategy. On the other hand, given the present levels of commodity indices and the resulting upside potential, I believe that going strategically long commodities (energy in particular) can generate better long term returns than chasing the remaining SP500 upside of 650 points or so. Should America truly opt for a far less regulated economy sometime in the foreseeable future which in my view is the single most important fundamental requirement for getting the valuations relative to GDP permanently back above their pre-1930’s levels, it will be a great time for owning stocks again (yet not before a major correction erases a good part of the ongoing rally).